1. Start with the salsa. Heat the oil in a large saucepan and gently cook the chilli, onion and pepper for 8-10 minutes, until soft but not browned. Take off the heat and stir in the sweet chilli sauce. Add the herbs and lime zest and juice, then season and set aside. 2. Using a heavy-based frying or griddle pan, cook the pancetta over a medium-high heat for 1-2 minutes on each side, until golden and crisp; set aside on kitchen paper. 11⁄2 minutes on each side, until golden, but don’t overcook, or it’ll toughen. For best results, weigh the squid down with a heat-resistant object to keep it from curling. 4. To serve, spread the rocket on plates. 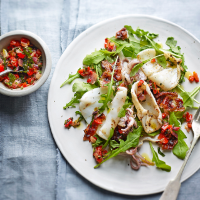 Arrange the squid on top and dress with the salsa and pancetta.